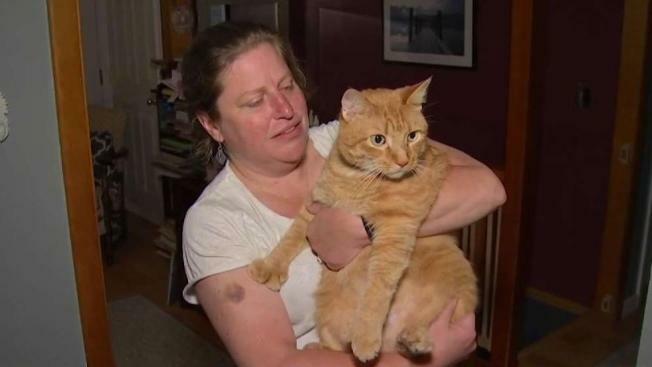 A Massachusetts family has been reunited with their cat seven years after the furry feline went missing. “It was disbelief...even a couple of days later it was still disbelief that this cat was found and back home,” said Dennis resident Rebecca Collins West. Tigger the tabby cat strayed away from West's home one day when she let him outside, and after a few weeks, the family accepted that he was gone. But West always thought he was alive. And she was right. Tigger was recently rescued from a home in Mashpee after the owner was moved to a treatment center. Staffers at the Massachusetts Society for the Prevention of Cruelty to Animals (MSPCA) shelter in Centerville scanned Tigger and discovered he had a microchip. They called West last week with the great news. “We had to listen to the message three times because we couldn’t believe that they actually found Tigger,” West said. She said she is so thankful to have microchipped Tigger when he was young, and without it, perhaps this reunion would never have happened. West said it was an emotional scene at the shelter on the day she picked up Tigger, and the four-legged feline had not forgotten her. “He just stood up majestically and looked right at me,” she said. Tigger had some scabs and worms but is healing well and getting back to his routine: stealing his sister Hazelnut’s cat food. West said she won’t be letting him out of the house anytime soon.